After 10 years in Engineering and International Business Development, I was fortunate to stay home with our son when he was born. When I wanted to go back to work I completed my Interior Design degree. I found Closet Factory after graduating and thought it would be a great first step, but what I found was my niche. 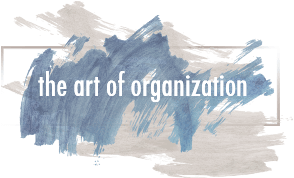 I love creating fabulous, functional spaces, creatively solving client’s storage and organization problems, and seeing projects completed. Closets, wall-beds, offices, pantries and garages – the variety in spaces we address is exciting. The quality materials, from melamine to real wood with custom finishes, give me unlimited possibilities to create solutions. I still take great pride in the designs I create. Often the Closet Factory website gives a client inspiration! Then it is my job to take a certain look and make it work in the totally different space. Here we used clear-coated solid maple doors with glass inserts to cover several deeper sections of hanging clothes. Trays pull out to give the client easy access to sweaters. LED lighting, custom-routed base and crown moulding, and coordinated oil-rubbed bronze rods and handles complete the look. I always start with the function of a space or project. Having lived and worked in Japan, my personal design aesthetic leans toward clean lines with a great use of space. 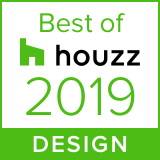 With clients, I love to use colors, textures, materials and finishes to personalize projects and to get the look that best works with their homes. Design challenges are my specialty! Here small angled walls in a former sitting room became the perfect place to display treasured handbags. 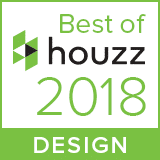 Adding ornate decorative details and a large island to the design challenge made it important to really consider the details as the floor plan came together. Continuing the look into the adjacent walk-in closet was also important. 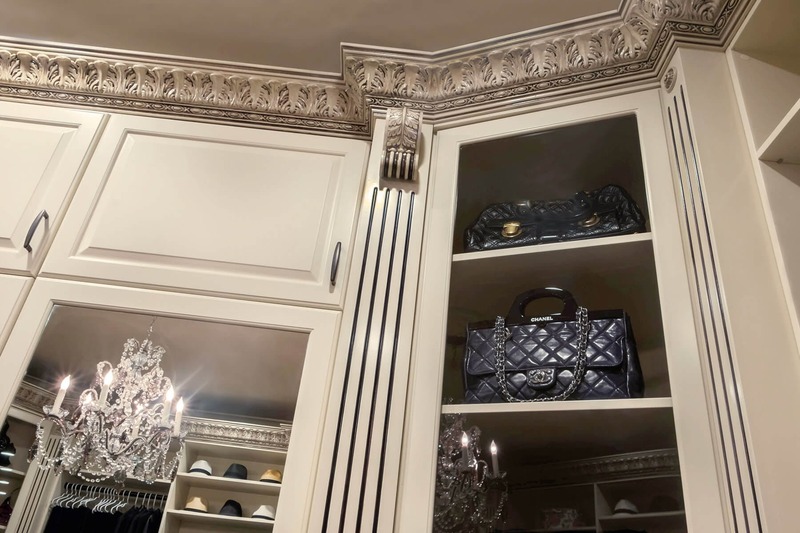 Every angle and corner mattered and with coordination of the manufacturing, custom finish and installation teams, the resulting closet exceeded the client’s expectations. 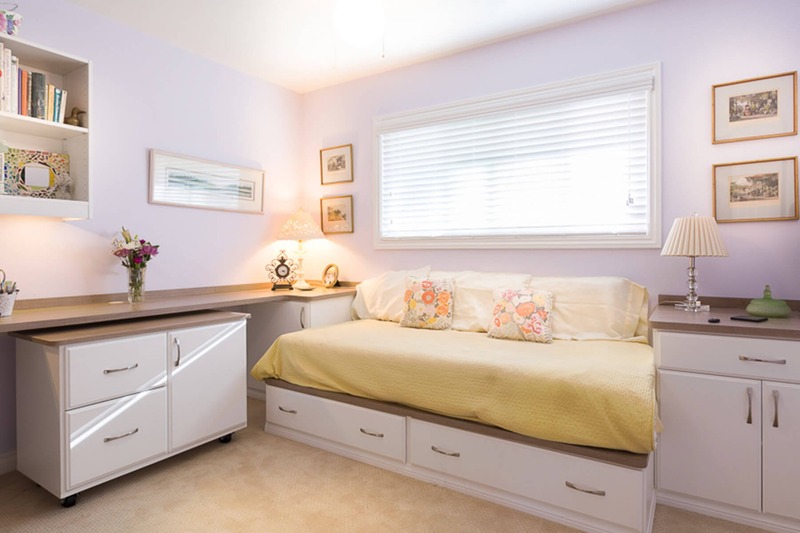 This former spare bedroom really became her “Retreat” when we integrated a Captain’s bed with storage and a rolling cart for crafts. Open yet organized and easy to access, shelves where placed at a custom height for the client. Large drawers in the Captain’s bed store gift-wrapping supplies. 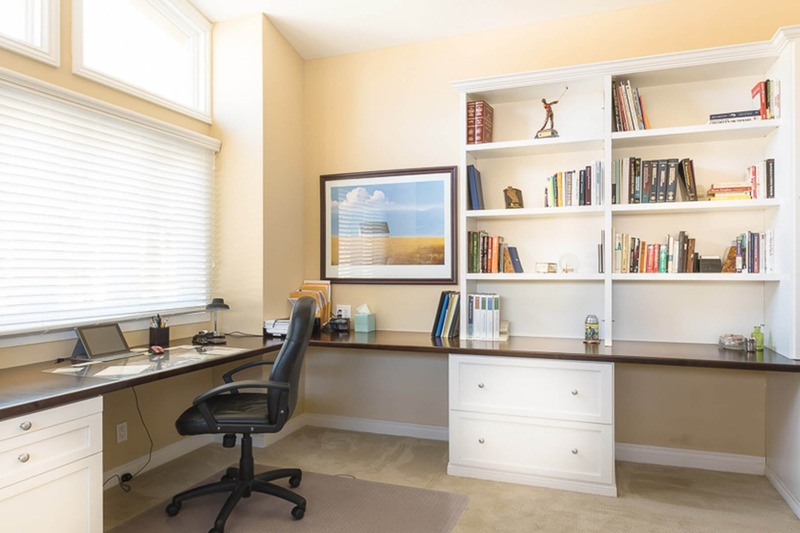 Ample desk space allows for a friend to join in on crafts or for projects to be set aside yet not way when its time to pay the bills. Side tables adjacent to the bed make it a welcoming space for visitors. Truly a multifunctional retreat! Coordinating his & her closets was a fun project! We used Smoke wood grain melamine for his full closet. The matching countertop under the window covers the 2 tie-butlers that hold his favorite ties. Easy to access shoes and plenty of room for golf sweaters and work attire, this masculine closet hit all the marks! Her closet is in a separate space, but attached to the newly updated bathroom as is his. We used Mist melamine for a more feminine touch with Smoke wood grain melamine accents to add cohesion. 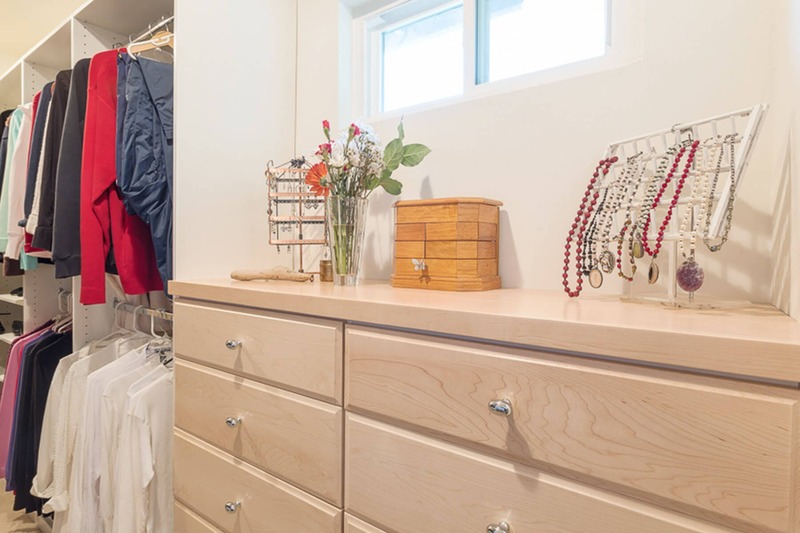 Jewelry drawers, covered tip-out laundry, cedar backing for special coats, a generous island as well as full-length mirrored doors set her closet apart from the crowd!